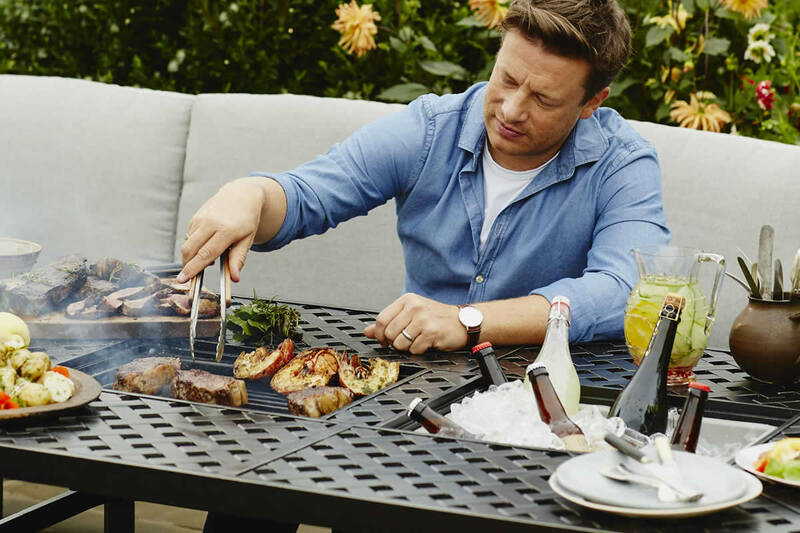 Jamie Oliver and Hartman have got together to produce this great range of stylish, comfortable, multi-functional garden furniture sets inspired by Jamie's love of cooking and dining in the outdoors with friends and family something which we have all witnessed on one of Jamie's many TV series. All the Jamie Oliver garden furniture range is made from a bronze or riven coloured cast aluminium, chosen for it's ability to be lightweight without sacrificing strength, with cushions made with a textured nutmeg coloured fabric. Hartman Jamie Oliver furniture offers more than somewhere comfortable to sit and eat; a lot of the sets also include features like fire pits and ice buckets built into them. This means that you can lounge around, prepare food at the table, and you can store your drinks without having to head inside every time you want another drink. While features like this are a great bonus, it is important that you ensure the quality of the furniture that you buy; and Hartman Jamie Oliver garden furniture doesn't disappoint in this respect either. High grade materials, intelligent design, and a combination of tables, chairs, and other outdoor furniture are some of the great features of Jamie Oliver furniture. By combining dining, seating, and food preparation features into a single table or dining set, it means that you can save space because you won't need to find room for both a dining set and a barbecue. It also means that you can prepare, cook, and watch the food while it cooks. The conversation can carry on even while you're checking the cooking of your food. This also means that you can enjoy the warmth or the heat from the fire pit in the middle of the table, and you can continue to enjoy time with friends and family without having to keep disappearing to the BBQ or the kitchen. The fire pit isn't an afterthought either. 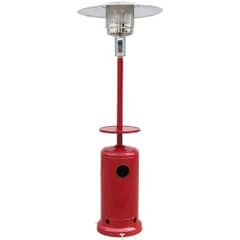 It has been designed so that you can prepare almost anything you would cook on a standard barbecue. Cook steaks and kebabs, burgers, and virtually anything else you want to prepare for your diners. 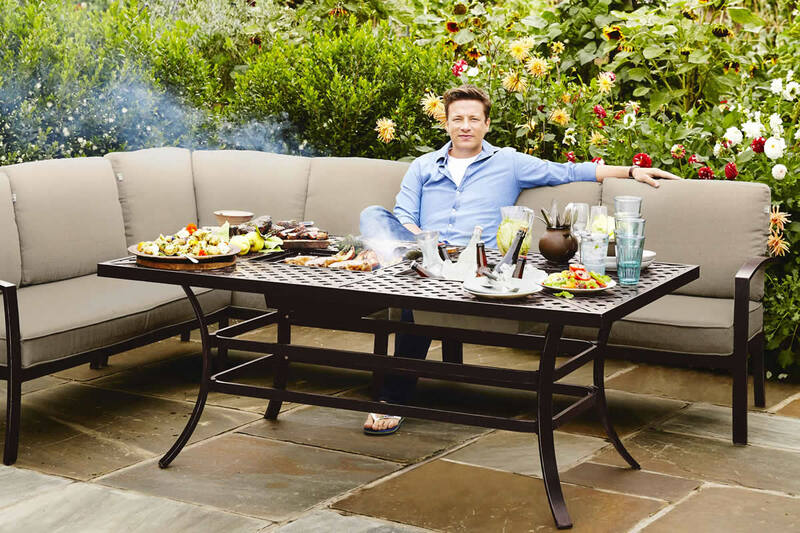 Jamie Oliver outdoor furniture is made from cast aluminium. The furniture is strong and robust, and designed to last. It is also weatherproof and durable, won't scratch easily, and the inclusion of soft cushions means that you can sit and enjoy comfort levels. The grilling set is a set of cast aluminium furniture that includes the fire pit in the middle of the table. It has been designed to ensure that the table doesn't get hot and that nothing leaks out of the pit, so that you can still enjoy a safe dining environment. The set also incorporate an ice bucket; ideal for storing your beers, a bottle of wine, or other drinks that you want to enjoy while you eat. Firepit and grilling sets from the Hartman Jamie Oliver garden furniture range typically include either six or eight seats. This means that they can comfortably seat a large family, and are still useful if you entertain people on a regular basis. The Deep-Seated Coffee Set has been designed for total luxury and comfort while you're lazing around and drinking coffee in the garden. The deep-seated chill out chairs are combined with a coffee table in a similar style to that the of the fire pit and grilling set. The coffee set works equally well as an addition to an existing Jamie Oliver garden furniture set, but also works well as a standalone set thanks to a great looking design. 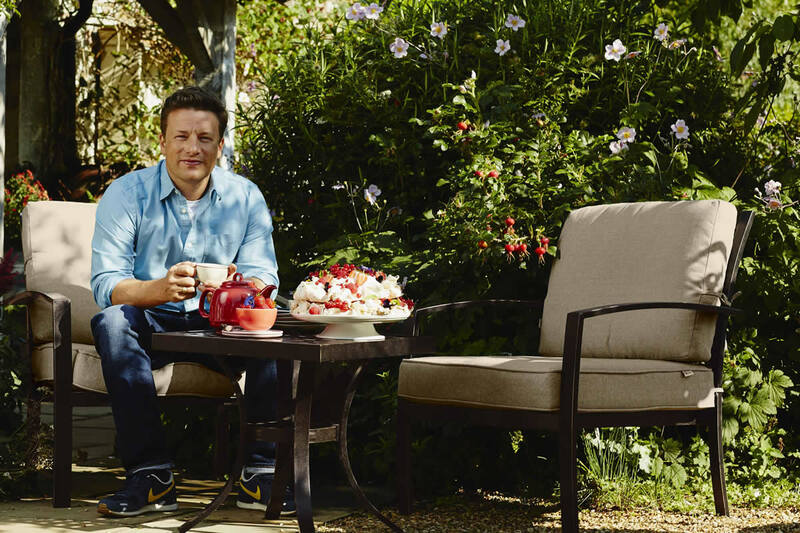 Another great Jamie Oliver garden furniture set is the Jamie Oliver sofa. This comfortable sofa works well as an individual sofa or it can be combined with a set like the grilling set to provide extra seating space. In the Garden Furniture World Jamie Oliver Garden Furniture sale, we also offer the Jamie Oliver Lounger. This reclining chair is especially great during the warm summer months when you want nothing more than to sit in the garden and relax. Choose between a seating or reclined position, and quickly and easily change that position depending on whether you're reading the newspaper, enjoying a cup of coffee, or laying back in the sun. Because the pieces that make up Jamie Oliver outdoor furniture sets are made from high grade cast aluminium, it means that the furniture will last for years. You can even leave it out during the cold and wet winter months, without the fear of it becoming badly damaged or overly worn. 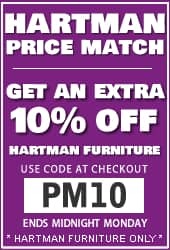 All Hartman furniture comes with a manufacturer's 2-year warranty, so if there is any damage or if you need any replacements, this will be covered by your warranty and you won't lose out. While you will need to bring the cushions in, doing so means that you can continue to enjoy the comfortable and enveloping seating experience that they offer. 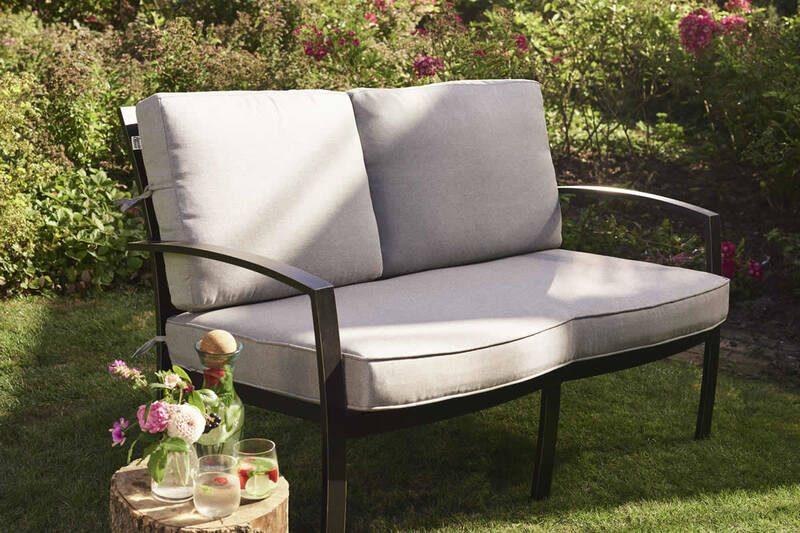 Hartman Jamie Oliver garden furniture has been designed by Hartman, who are well known for their manufacture of long-lasting, durable, and comfortable furniture, with Jamie Oliver, who is best known for his cooking and entertaining. 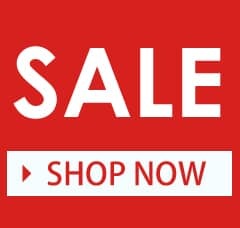 You can enjoy the best of both worlds by buying a furniture set or piece of furniture from this range, and at Garden Furniture World we have an extensive range of these and other furniture sets and items for sale. Garden Furniture World is the official website of Dawson's Department Store. We sell an extensive range of garden furniture. 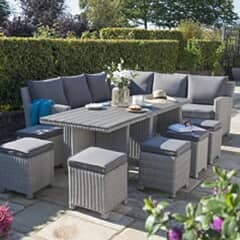 As well as the Jamie Oliver fire pit set and loungers, we also have furniture from the likes of Kettler, Alexander Rose, and Bramblecrest, as well as others. You can buy covers to protect your furniture, accessories to further enhance your outdoor experience, and we have the cushions, parasols, and other accessories that really do heighten your lounging experience.